ELV has no idea what these people are doing. Even less what they’re doing on the walls of a steakhouse. But they sure seem to be enjoying themselves! Perhaps they’re just as ecstatic as ELV over the cheese selection here. What this gal is doing pointing a machine gun at us outside the Men’s Room is also puzzling…. The point is, the cheese selection here is so good…. … that our staff overindulged just thinking about it. And unlike some other great venues du fromage, Morel’s isn’t stuffy or intimidating in the least. You check your cheese off of a large printed menu — 3 selections for $18; 5 for $26 (after checking them for ripeness at the cheese counter of course) — and then dive into a buttery Mt. Tam, silky Chabichou du Poitou, or Winchester Super Aged Gouda so sharp you can cut your steak with it. They even have (on occasion) Castelmagno — something of a holy cheese grail for ELV ever since he tasted the real enchilada in Rome (Italy, not Georgia) years ago. Almost chalky in the mouth, Castelmagno (cas-TELL-man-yo), has an elusive, earthy flavor that reminds us of woodsy mushrooms, leavened with a bit of citric tang. Washed down with a semi-dry, Francois Pinon “Tradition” Vouvray (chenin blanc), it is about as perfect a cheese and wine match as you’re likely to get off a menu in a Las Vegas restaurant. As for the rest of the menu — the steaks are good, but not great, the sides functional but hardly noteworthy. The shellfish on display sometime look (and taste) fresh and vibrant, and sometimes are best to leave well enough alone. But the Caesar salad is made tableside in wooden bowls and is probably the best in town. Correction: It is the best in town outside of ELV’s house, and there’s no denying the fabulousness of the (60+) cheeses, and the charcuterie, and the housemade rillettes (Berkshire pork and Scottish salmon), and the wines by the glass that make this place worth going out of your way for. Please do not get John into a cheese pun-off. I Cantal you too many stories of groans and eye-rolling. But hey, if that Berkswell for you . . .
About all this place does really well is the Caesar and the cheese – agreed there. The steaks are Ok and the sides decent (the fondue is also pretty good). 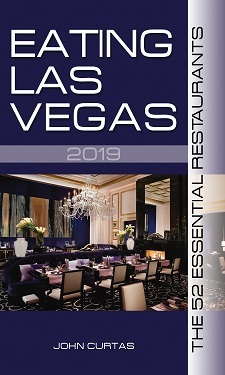 But considering the prices out the door (my dinner for two was north of $450 that included a $125 bottle of Domaine Serene) – I’d much rather stick to my old standy, Neros at Caesars, or STEAK in Henderson (though I was told it might have recently closed). John – do you have confirmation about STEAK closing its doors? I experienced Morel’s this last weekend. Didn’t do anything overly extravagant – got a 3-cheese selection as an apetizer, the 14oz, 35 day aged New York sirloin, asparagus and their version of scalloped potatoes. The steak was good – I’ve had better – and the sides were good – again, I’ve had better. The best part of the experience was the cheese. I’ve had better food for less than half the cost, but if you combine the food with the first class dining experience, you will leave feeling like you got what you paid for.